Steam user reviews are an odd beast. Displaying prominently on the world’s largest game store, they’re vitally important to the general perception of a game. While individual reviews can be bought and paid for, the overwhelming tide of humanity generally gives a good estimation of quality – assuming your game isn’t caught up in the latest bandwagon parade. 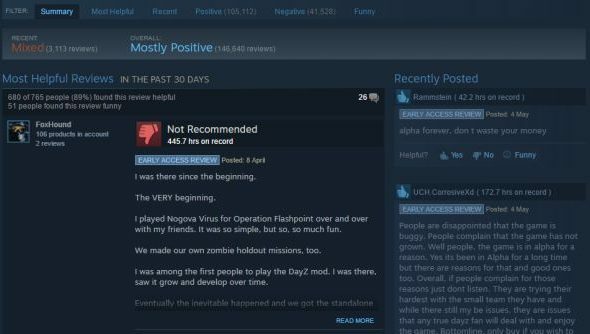 Valve haven’t done much to the system in a long time, but announced yesterday that they want to more heavily emphasise recent reviews, both in terms of upvoting individuals and in the algorithm that passes final judgement. Games will now have two review-generated ratings, one overall and another for the past 30 days, while there’s a dedicated section for recent reviews so they can be more easily found by potential buyers. Want to know what people are thinking? Check out our review system, BetterCritic. A recent reviews column has been added for more visibility, meaning new reviews have a hope of becoming rated as highly as old ones, and preferably supplanting them. There are now two ratings for a game – one based on reviews in the last 30 days (assuming there have been enough reviews in that time and that the game has been on Steam for at least 45) and one based on all reviews. This is located at the top of the store page, same as always. All of this is collated in a summary tab on the review interface, the now-default way to look at user reviews on a store page. The overall system can still be viewed from other tabs. There’s a button to indicate you didn’t pay for the game you’re reviewing, though it doesn’t distinguish between a press copy and a gift. You can see the effect of these changes already, for example on the DayZ Steam page. While 71% of all user reviews for the survival sim have been positive, only 41% of the ones in the last 30 days have – dropping it from an overall Mostly Positive to a recent Mixed. It’s generally a good change, though it will increase the power of hatemobs doing mass negative reviews in an attempt to prove … something. Devs who have a shaky launch but follow it up well won’t be locked into those poor initial impressions, while games that are abandoned, lose their luster quickly or are patched poorly can have appropriate warning signs right there. Perhaps predictably, I still wouldn’t pick Steam user reviews as a way to judge a game over, well, almost anything else, but it’s better than nothing. Have a look at Valve’s full list of changes and reasoning in their official post.